About half of adults who think they have a food allergy, actually don’t. A study released in January showed many adults think they are allergic, but haven't been tested. KANSAS CITY, Mo. 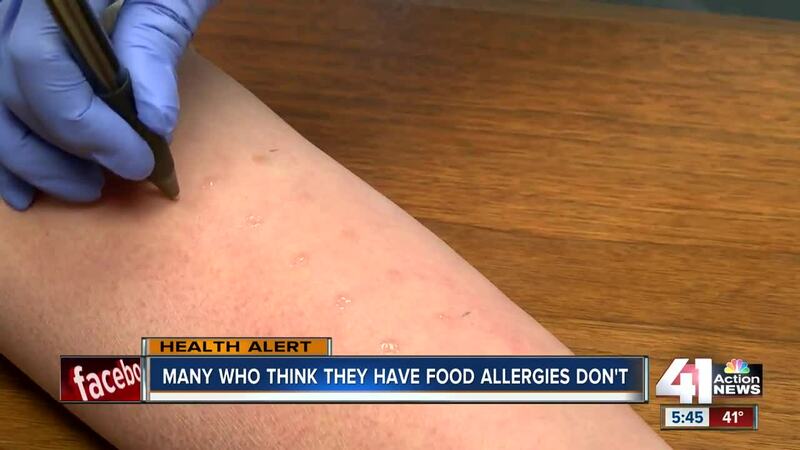 — About half of adults who think they have a food allergy, actually don’t. A study released in January showed many adults think they are allergic, but haven't been tested. The report published in The Journal of the American Medical Association concluded of the American adults with confirmed food allergies, half developed that allergy as an adult. Doctors in Kansas City said if you have a reaction after eating a food, it’s important to visit your primary care physician and perhaps a specialist to receive testing. “Eighty-five percent of what I'm going to learn about a patient comes from sitting and talking about what were their allergies when they were little: did they have colic, did they have trouble with food as a baby, and then on up to even as an adult,” said Dr. Bruce Pfuetze, an allergist at College Park Family Care Center in Overland Park. The top food allergies in adults are shellfish, milk, and peanuts.